On the heels of Queen and Adam Lambert’s show-stopping opening performance at the Oscars on Sunday (Feb 24th), Lincoln Square Productions has acquired the U.S. television rights to a documentary from Miracle Productions on the iconic band and their new regular frontman, Adam Lambert. Produced by Jim Beach and acclaimed writer and filmmaker Simon Lupton, The Show Must Go On: The Queen + Adam Lambert Story airs Monday, April 29th from 8-10 pm ET/PT on the ABC Television Network, prior to Queen and Lambert’s already sold out July/August 2019 U.S. Rhapsody Tour. With rare concert footage and exclusive, revealing portraits of the band members off-stage, The Show Must Go On chronicles Queen and Lambert’s incredible journey since they first shared the stage together on American Idol in 2009. From his humble beginnings and meteoric rise on reality TV to now standing center stage as lead singer of Queen + Adam Lambert, the documentary features brand new interviews with Lambert, his parents Leila and Eber and Queen founding members Brian May and Roger Taylor, as well as American Idol judge Simon Cowell, Golden Globe and Oscar winner for Best Actor, Bohemian Rhapsody’s Rami Malek and Foo Fighters’ Taylor Hawkins. Queen remain vanguards of rock in the 21st century. They scored their first No. 1 hit on the Billboard Hot 100 in 1980 and soared through that decade performing in stadiums, including their landmark 1985 performance at Live Aid which was seen by three billion people worldwide. Freddie Mercury died of AIDS in 1991 and a star-studded tribute concert the following year was thought to be the conclusion of Queen live. The Show Must Go On simultaneously follows the ensuing 27 years. Lambert, starting at the age of ten, is beginning to come of age, discovers his love of music and finds a voice of his own while, across the pond, the surviving members of Queen see their songs remain staples with DJ’s, in clubs, in theaters around the globe with their hit musical We Will Rock You and in movies. Lambert and Queen intersected in spectacular fashion when Lambert first performs with the band, singing “We Are the Champions” as one of only two finalists on Season 8 of American Idol. The public reaction was remarkable and first seeded the idea that perhaps Lambert might become a permanent fixture in the Queen family. In 2012 Queen + Adam Lambert was born. To date, Queen + Adam Lambert have performed together in nearly 200 sold-out shows in arenas and stadiums across the world. 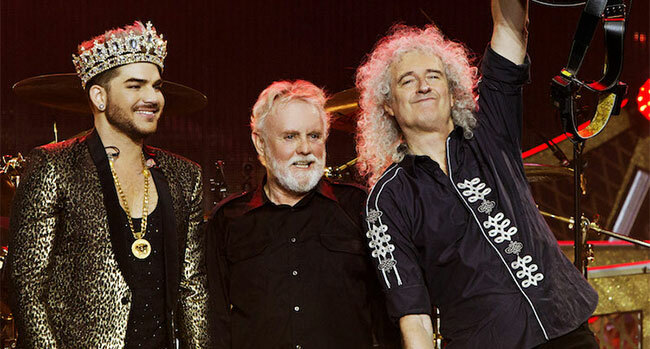 The Show Must Go On: The Queen + Adam Lambert Story is produced by Simon Lupton and Jim Beach for Miracle Productions and Matt Lombardi is executive producer for Lincoln Square Productions.